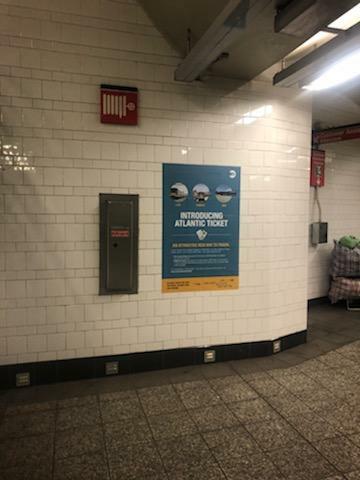 Few subway stations only feature one advertisement of the Atlantic Ticket. Photo credit: Asar John. 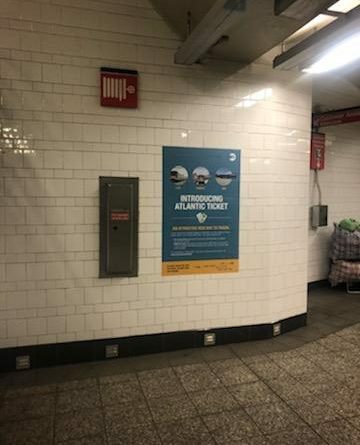 “An attractive new way to travel” is the way the MTA describes the Atlantic Ticket in its ads in Southeastern Queens and Brooklyn stations. Or should I say only Brooklyn stations? Or maybe JUST Atlantic Terminal? After all, it is called the ATLANTIC Ticket. But before I totally slam down on this “attractive way to travel,” you should hear the details about this ticket. The Atlantic Ticket is a portion of the “Freedom Ticket,” which has been advocated for by Permanent Citizens Advisory Committee to the MTA since 2007 as an effort to reduce NYC railroad fares and provide free transfers from the bus to the subway, according to amNewYork. The Atlantic Ticket debuted last June. It serves mainly Southeastern Queens stations that are far away from a subway station. The Atlantic Ticket is available to any Long Island Railroad passenger traveling to or from any Southeastern Queens or Brooklyn LIRR stations. In order to boost this initiative, the Atlantic Ticket is offered at a discounted price, since the regular price traveling towards the two city terminals is considered costly. The nine stations where Atlantic Ticket is available for use are: Atlantic Terminal, Nostrand Avenue, East New York, Jamaica, Rosedale, Locust Manor, Laurelton, Hollis and Queens Village. The ticket can be purchased from a LIRR ticket vending machine at any of those stations as it is not available on the MTA mobile ticketing app eTix. When you purchase the ticket, be wary for there are two versions of the ticket: the one way ticket (valid only on the day of purchase), which is five dollars, and the weekly ticket, which is $60.00. A weekly ticket not only gives you a full week of LIRR rides within Southeastern Queens and Brooklyn, but also a seven-day unlimited MetroCard on the other side of the ticket. It’s a pretty good deal as it would cost a fortune to ride LIRR and subway for a regular price throughout a week. In fact, a regular one-way ticket between Atlantic Ticket stations cost $10.25 during peak hours, while the combined weekly pass costs $104.25, amNewYork reports. And that amount doesn’t include the $2.75 subway fare if you have to complete your commute by subway or local bus. This means that the Atlantic Ticket is still your best bet if you commute by subway/bus and the LIRR. Now as juicy as the Atlantic Ticket may sound, it doesn’t seem to be so “attractive” as the MTA claims it is. I say this because there isn’t much advertising for it at all the stations it serves. I first heard about it in June from a passenger on the LIRR. I searched it up on Google and found more information about the ticket on the MTA website. When the school year began, I took full advantage of the weekly ticket option. It all felt like both perfect timing, and a blessing from the public transportation gods. But for people that use the stations where it is available, how will they know about this blessing/money-saver known as the Atlantic Ticket since there are barely any advertisements about it on the platforms? To find an answer to this question, I went on a search around Southeastern Queens to find any advertisements of the ticket. My first stop was Jamaica Station, a major transportation hub in Queens, that services both the subway, LIRR, buses, and The AirTrain to John F. Kennedy Airport. Now if you’ve ever visited the Jamaica station, you would know it’s the Goliath train station in Queens, nestled in the heart of Jamaica. You can’t miss it. The station is filled with large pockets of space, including the blank walls where space for large, eye-catching ads is abundant. Well, there are ads in the Jamaica Station. However, there is only one advertisement of the Atlantic Ticket near the ticket booth, and a single lousy stack of brochures that promotes the ticket in the corner of the waiting room. There are none on the five platforms, the mezzanine level, or by the AirTrain. There is barely any sign of The Atlantic Ticket’s existence at the grand Jamaica Station. This stop, however, is not the only one fearful to advertise the Atlantic Ticket. I boarded the next arriving Hempstead-bound train to Hollis station which had the same lousy brochure, this time enclosed within a bulletin board with a glass screen over it. After traveling to St. Albans station, I walked up the stairs and onto the empty, windy and slightly curved platform, and found no sign of advertisement for the ticket. Over the Rosedale station, with hopes of spotting the rare Atlantic Ticket ad, I find the same lame stack of brochures like the ones at Jamaica. A four minute ride on the next arriving train takes me to Locust Manor, giving me the exact same results as St. Albans. Same can be said for the Nostrand Avenue station in Brooklyn. The eerie looking East New York station in fact features a few of the larger ads shown at Atlantic Terminal. However, one of the ads is cast off to the end of the Atlantic Terminal-bound side of the station, away from exits and entrances where it goes mostly unnoticed unless you walk to the end of that platform. The most advertised station I stumbled upon was Atlantic Terminal, which has an obnoxious decent amount of advertisements inside. However, there are not many advertisements within LIRR waiting areas of the platform, but most ads are placed within the subway parts of the transportation hub. After visiting all the Atlantic ticket eligible stations, my investigation was not complete. I returned to Jamaica station to speak to employees who are looking at the Atlantic Ticket from the inside out, and not from the outside in, as I and many other Atlantic ticket users do. After speaking to several MTA “ambassadors” wearing their bright orange safety vests and large pins that read “HOW CAN I HELP YOU?” Well, clearly not very much, is my response to the obnoxiously large and contradicting pins they wear. When I asked if I could find any information about the promotion of the tickets they all responded, “Maybe you could ask the station manager any questions about what you are looking for.” So I took their advice. The Jamaica Station manager, who refused to give her identity, claims that the MTA does in fact much to promote the ticket. To verify if I could receive any information from service representatives who were standing by a podium in the waiting room, they directed me to read the advertisement by the ticket booth. Doesn’t seem like the best way to represent the MTA, does it? As the Atlantic Ticket reaches its midlife in December, my question of whether enough people know about the ticket to take advantage of it and make it permanent will continue to wander. That, and several other questions I have for the MTA that I may never get an answer to, which I find all too familiar and typical.